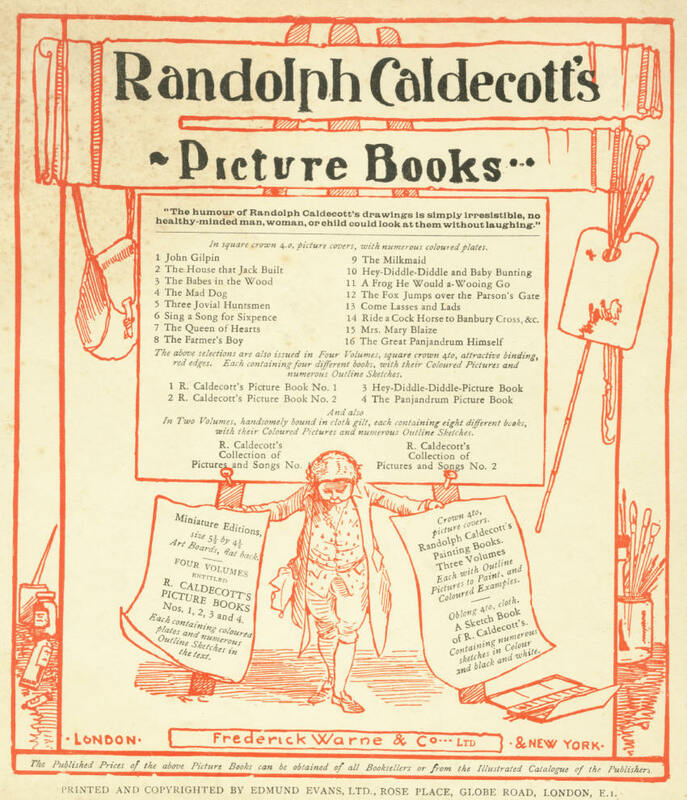 When Randolph's "Picture Books" were first published, no dates of publication were included. 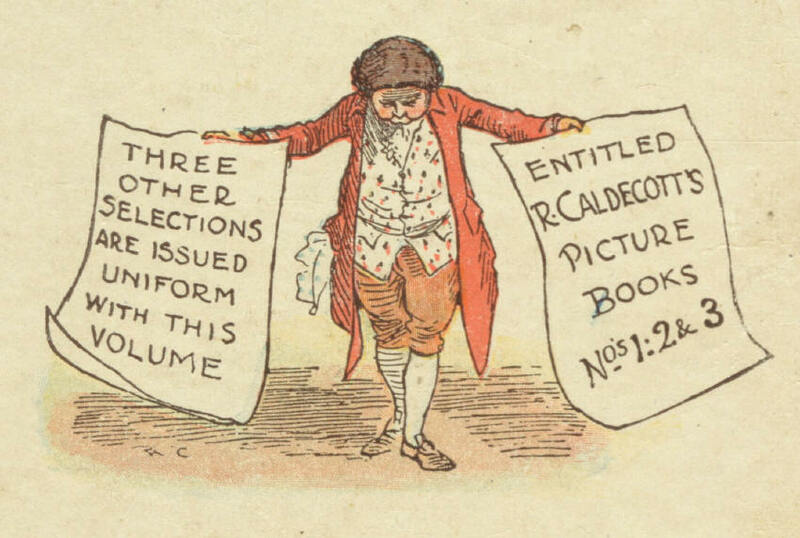 It therefore requires some detective work to deduce the publication date of early editions. 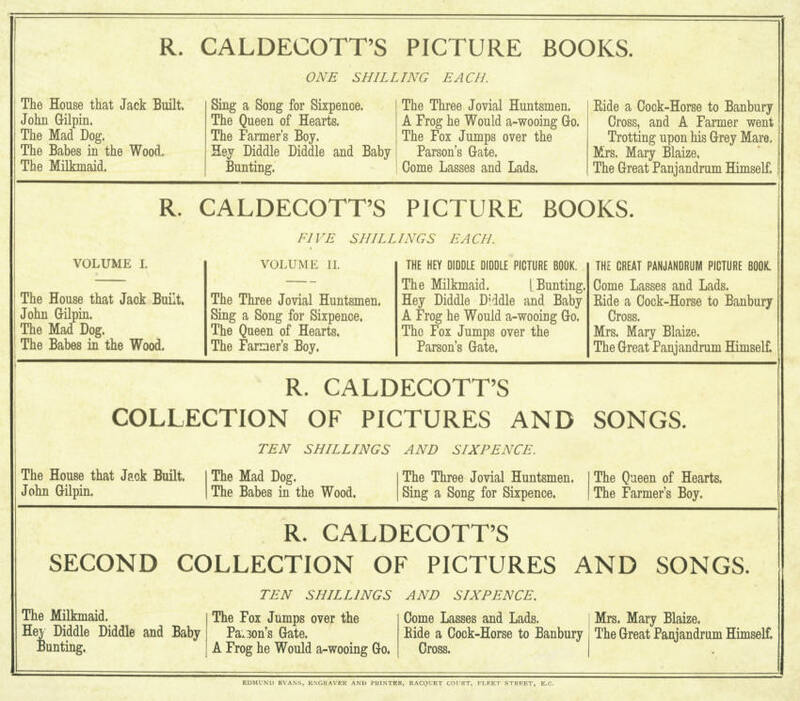 The Earliest editions were all published by George Routledge & Sons. 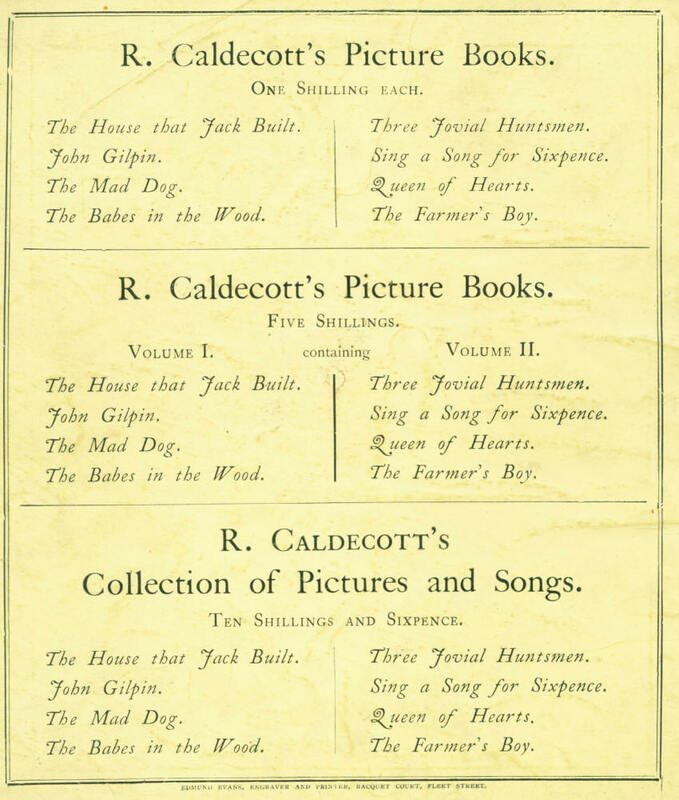 The back covers were used by the publisher to advertise other books. 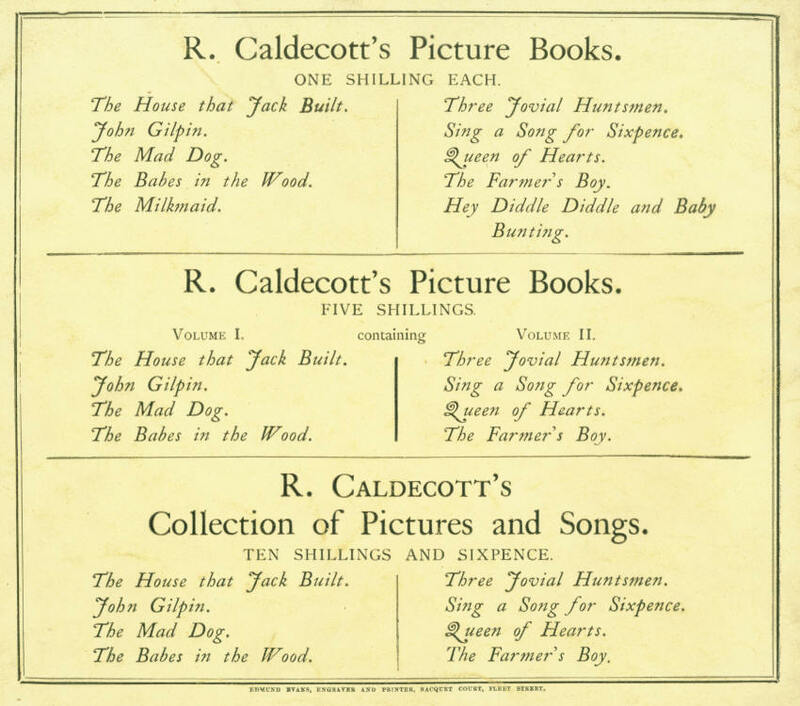 Clearly, they could not advertise books which did not yet exist! 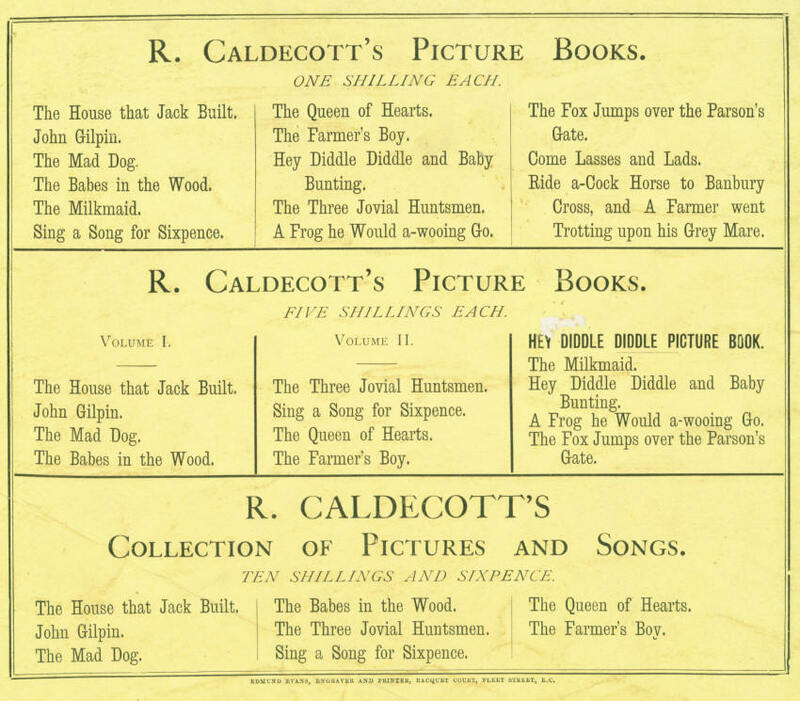 So, for example, first editions of the first two Picture Books had adverts for similar titles by other authors or illustrators. 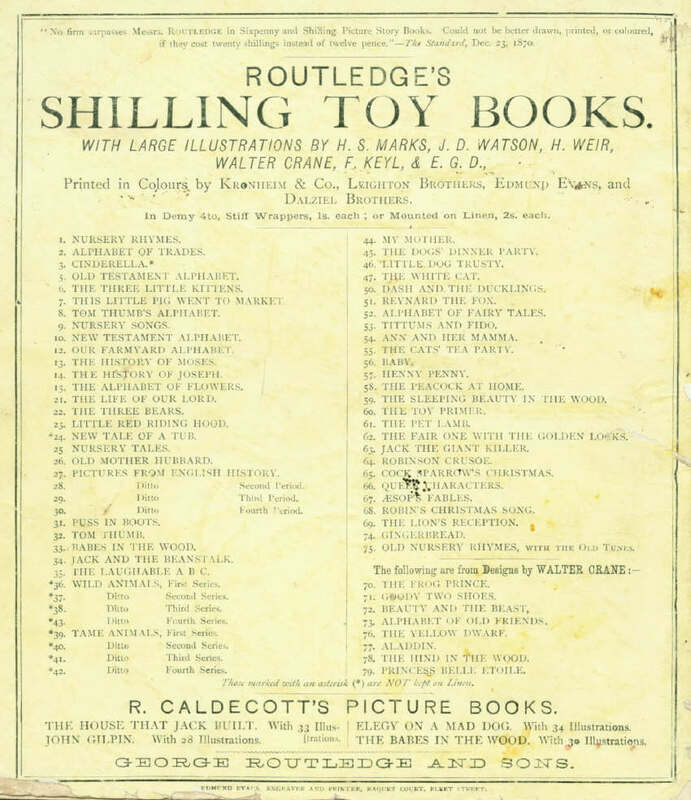 "LTD." added after "Frederick Warne & Co..."
The "P/L" column above indicates "Portrait" or "Landscape" format of each book: see "Sizes" below. 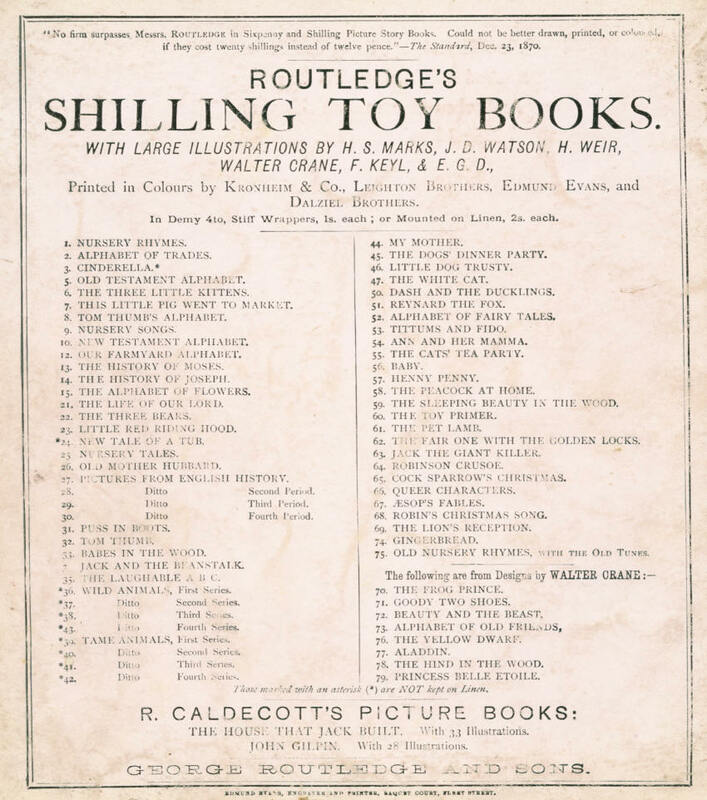 In about 1900, the publishers Routledge sold their interests in children's books, with all the colour plates, to Frederick Warne & Co, who continued to publish the books but who replaced the Routledge name on the front covers with their own. At about the same time, the "price one shilling" was quietly dropped to allow for price increases. 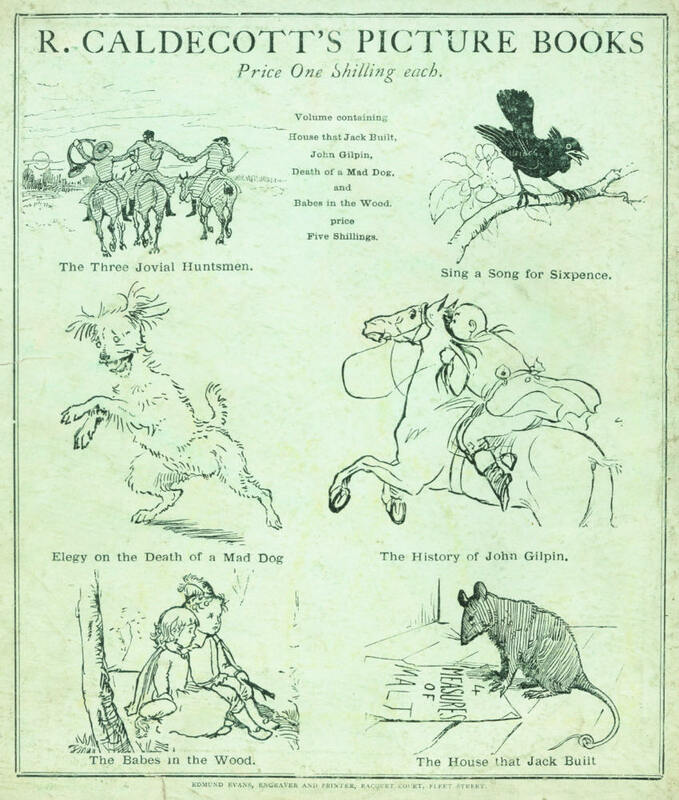 As we have mentioned elsewhere, Warne's editions did not use quite the same six colours as the originals, and lack the subtle quality which Caldecott in his lifetime had achieved with the help of Edmund Evans the engraver and the original publishers. On the other hand, the soft covers of the Routledge editions are easily damaged and on many surviving copies have fallen off the books; Warnes replaced these with a stiffer cover and more durable binding. Frederick Warne eventually handed his company over to his sons. One became engaged to one of their promising authors, Beatrix Potter - but died before they could get married. The son who then took over, embezzled money from the company, but was found out, convicted and imprisoned in April 1917. 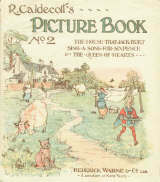 (For more details, see our "Beatrix Potter" page.) 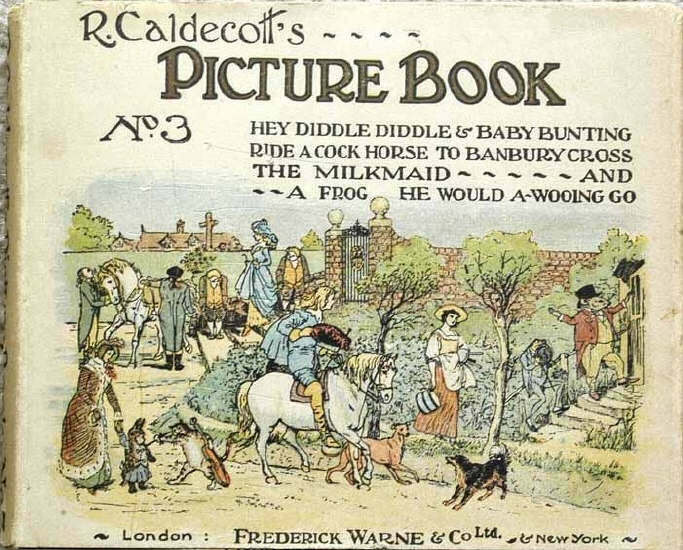 Thereafter, the publisher became a Limited Company, and their name was changed to Frederick Warne & Co Ltd. So any editions bearing this name plus Ltd. on the cover were published after this date. "EDMUND EVANS, ENGRAVER AND PRINTER, RACQUET COURT, FLEET STREET, E.C." "PRINTED AND COPYRIGHTED BY EDMUND EVANS LTD., THE RACQUET COURT PRESS, LONDON, S.E." "PRINTED AND COPYRIGHTED BY EDMUND EVANS LTD., ROSE PLACE, GLOBE ROAD, LONDON, E."
"PRINTED AND COPYRIGHTED BY EDMUND EVANS LTD., ROSE PLACE, GLOBE ROAD, LONDON, E.1." 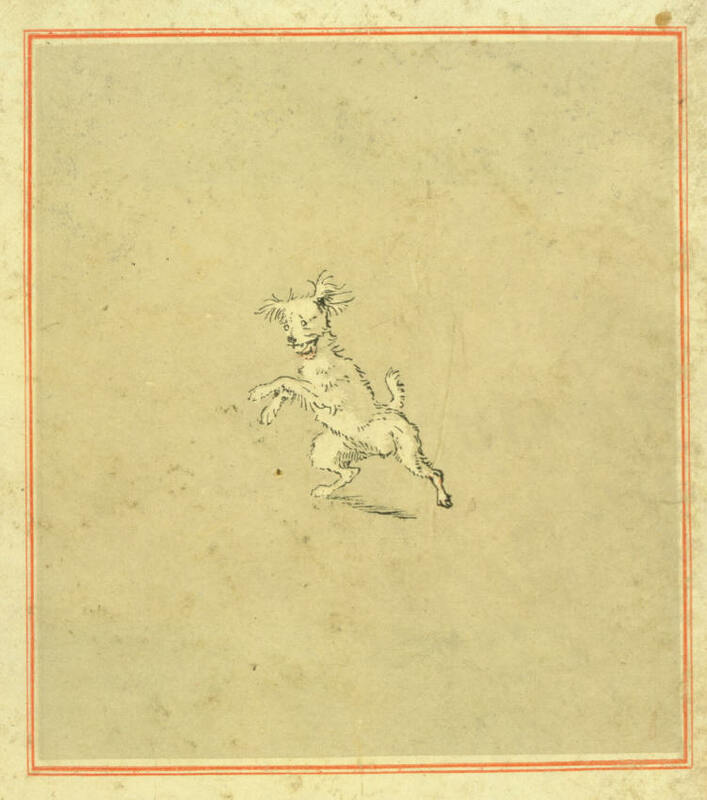 "ENGRAVED AND PRINTED BY EDMUND EVANS, LTD., 154 CLERKENWELL ROAD, LONDON, E.C.1." "PRINTED IN GREAT BRITAIN. 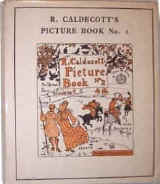 COPYRIGHT EDMUND EVANS LTD., LONDON"
Relatively recently, some Picture Books were re-issued in a new edition in the USA, by Avenel Books, a division of Crown Publishers, Inc., 419 Park Avenue South, New York, N.Y. 10016. 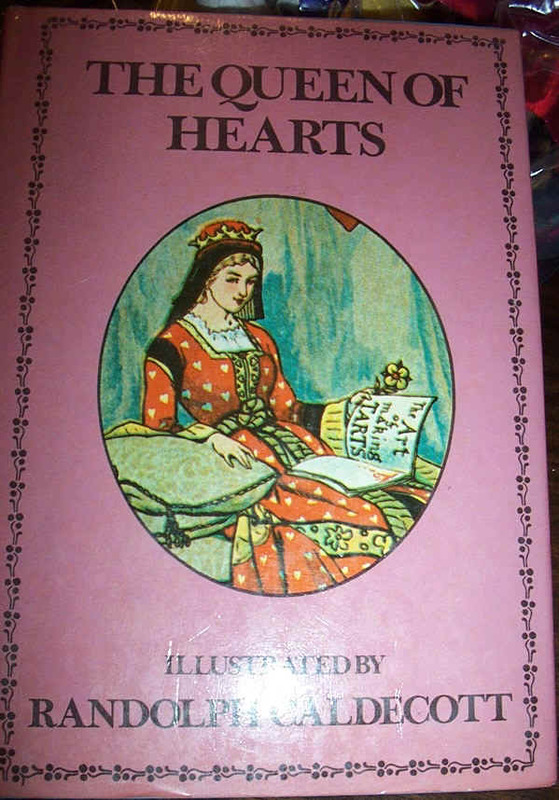 The front cover of an example (The Queen of Hearts and Sing a Song for Sixpence, in one volume) is shown here (we are grateful to Brenda Manter for this picture). Another edition was produced by Viking Press (Warne Classics Series) in 1986. Hey Diddle Diddle and Baby Bunting 1-85079-1??-? 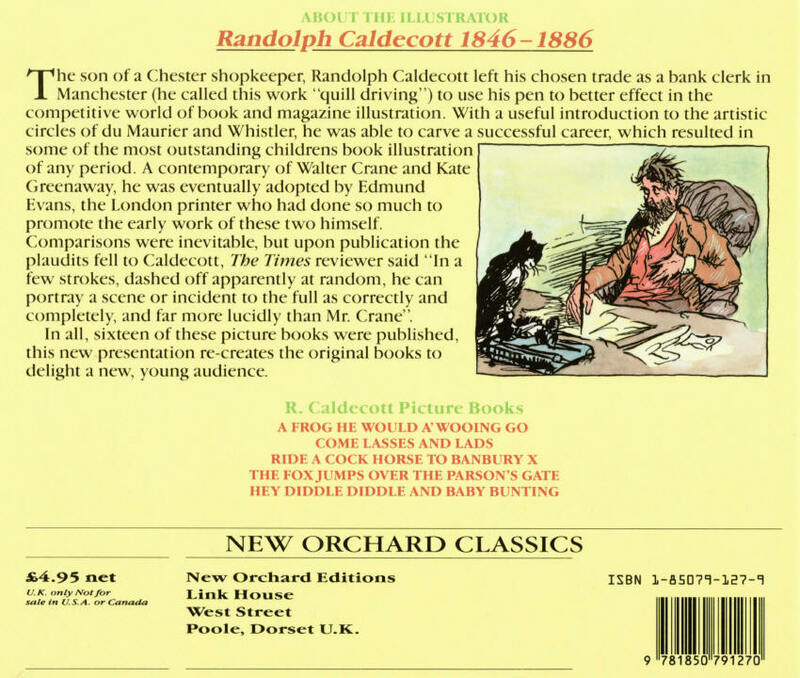 In the 21st Century, a complete facsimile reprint of all of Randolph's Pictures Books (in English) has been produced as a boxed set in Japan, together with an introductory volume (in Japanese) with text by Dr. Brian Alderson. 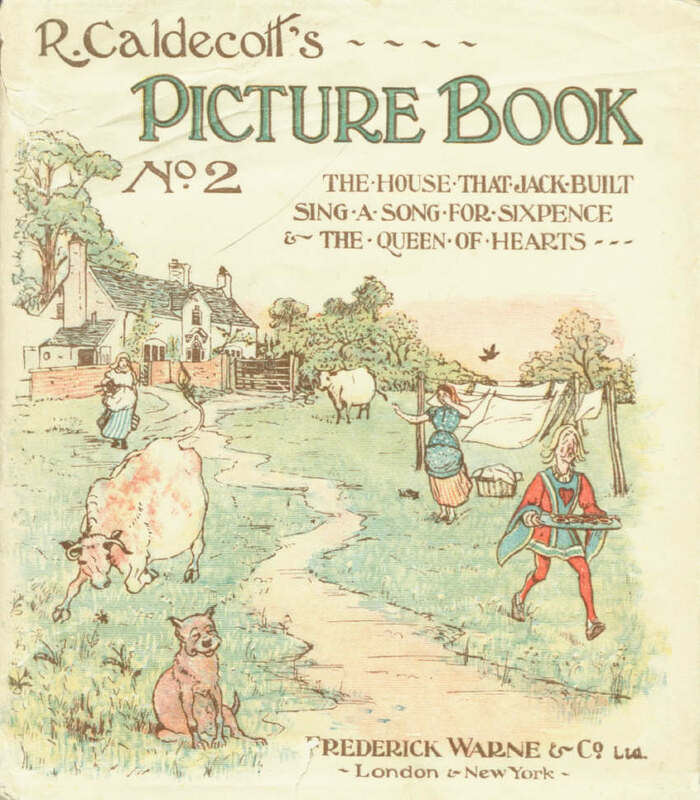 Another recent edition in USA is a facsimile of the Routledge version of Sing a Song for Sixpence (30 pp., size 23 cm), published by Huntington Library Press, 1151 Oxford Rd., San Marino, CA 91108 Phone: 626.405.2172 Fax: 626.585.0794 price US$2.95. 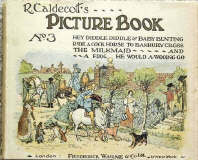 The publishers are (at 6/2004) considering producing similar reproductions of 5 more of Randolph's Picture Books. The standard editions of all 16 of the Picture Books were all about the same size: 9 x 8¼ inches (23 x 21 cm). However, some of the titles had the longer dimension as the height ("Portrait" format), while others had it as their width ("Landscape" format). Can anyone tell us: for how many years were these miniatures produced? 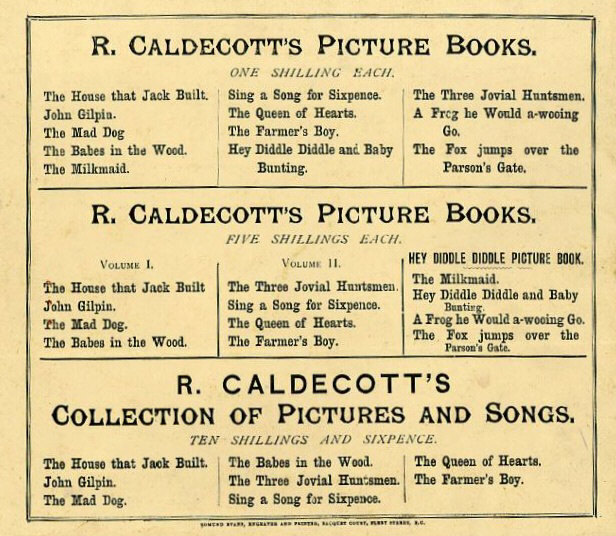 Miniature editions of the four combined volumes were also produced by Warnes: these, like the individual miniature books, are 53/8 x 49/16 inches (13.7 x 11.7 cm), but have hard covers. These were still undated (but we have seen a copy which, from the inscription inside, was given as a Christmas present in 1948). In recent years, an ultra-miniature edition of "Come Lasses and Lads" has appeared, for use in dolls' houses!